We had a great time leading the Spiritual Life Week at Morrison Academy in Taichung, Taiwan! We performed and spoke in their chapels each day for high school and middle school on the theme of Trusting in God. On Tuesday we led a class on improv which closed with enacted prayer (http://RichDrama.com/Workshops) and on Thursday night we did worship and more enacted prayer ending with a spectacular enactment in which about a dozen of them prayed for their friends who don't yet know the Lord. It was touching to see their love for their peers! We closed by inviting the students into our "tent" as shepherds and treating them to matzo and hummus while we explained the 23rd Psalm. We had some one-on-one sessions with students that signed up, taught in individual classrooms as young as Kindergarten. One of the second graders asked us if we liked God. We prayed often with them in groups big and small to dedicate their lives to the Lord. The eighth graders watched trailers of all our films: http://films.richdrama.com. The sixth and seventh graders sang "Trust and Obey" to show us they were following the theme. The Women of Worth class was Rich's 16th women's group he addressed, and then two of the women's small groups asked him to answer questions and the speech class was all girls, so he's now up to 19 women's groups! The Men of Honor class invited Rich to address them as Eric Liddell, which was a fun way to expose them to an honorable man and preview the Sunday night performance of Beyond the Chariots (http://RichDrama.com/BeyondtheChariots). There were at least three in attendance there who knew people who were in the internment camp where Eric Liddell died. Monday we took the high speed (over 160mph) train to Kaosiung to perform Big Fish Little Worm (http://RichDrama.com/BigFishLittleWorm) for the Morrison campus there, made up of grades K-9. The photo is with some of the ninth graders. On our last day in Taiwan we did faculty devotions and Big Fish Little Worm for Morrison's Taipei campus (K-9) followed by seven classes of all but three grades. We had a ball! I'm writing en route to Singapore, where I'll be performing. Joyce is also in the air but--sadly--she's heading the other direction to get back home in time to speak in Pittsburgh: http://itinerary.richdrama.com. You can see our photos at http://SwinglesInAsia2011.Shutterfly.com. I'm sipping a coconut under a palm tree watching hundreds of ships go in and out of the busiest harbor on earth as I recuperate from our wonderfully busy schedule in Taiwan and recharge for performances here this weekend: http://itinerary.richdrama.com . Joyce got to preach this morning on Psalm 1 at the House of Blessing Church in Taichung, Taiwan. Introduction by Dan Robinson, principal of Morrison Academy. Translated into Mandarin. James' grandfather, the great-great grandson of Hudson Taylor, saw Beyond the Chariots three times on our different trips to Hong Kong. You can read more about him here. We were delighted to connect with James throughout the week and to pray with him tonight. Can't wait to see how the Lord uses your willing heart, James! We'll be praying for you! 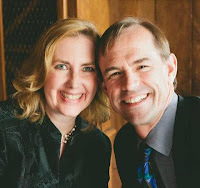 They just posted the trailer to Indescribable, the movie in which Joyce and I play Mr. and Mrs. Lehman. Indescribable Trailer from Indescribable The Movie on Vimeo. It has been so clear to us that people are praying for this journey by the timing of the entire day! Every place we went the bus was ready to go within five minutes of us getting there! That morning we got our directions based on the wrong airport, thereby putting us at a station we wouldn't have gone to to catch our bus to our hotel, but that was exactly the station we needed to catch a free shuttle to Taipei 101, the second tallest building in the world: a perfect place to prayer walk the entire city in a matter of minutes. One bus that was supposed to come in 10 minutes came in 1, while I was buying water, but the next was right behind it, and we loaded within 5 minutes of my return. That bus happened to be the one that English speakers boarded just before we needed to disembark, and they were able to confirm where to get off. We were remarking that every time we messed up, the Lord used it for the good. Then, when we checked in at our hotel they told us that our reservation was at a hotel in Taipei, not in Jinshan where we had just arrived! The hotel where we stood had only one room available, and it was about $1500/ night more than the room we'd already paid for. Don't worry, that is in Taiwanese dollars, and they didn't charge us for the increase since the two hotels were connected. We chose the site because it is on the beach AND has hot springs, so I'm not certain how the website put our reservation at the other hotel! Our room was usually more expensive because it had it's own hot springs. Once we arrived, we couldn't figure out how to make the water hot, so we were on our way to ask the front desk when we struck up a conversation with a family that spoke a bit of English. They ended up taking us to a night market, one of the things we'd hoped to do! Upon returning to our room the hot water in the hot springs worked! We gave the family a link to a page I set up this morning just for them to download the Eric Liddell documentary I worked on. The timing of this morning just capped it all off! I went for a swim in the ocean and had some of the best waves I've ever body surfed. Upon reaching the shore they closed the beach. I guess the waves were so good because there's a typhoon out at sea! As I write we're riding through some beautiful, lush, mountainous countryside, praying for this whole amazing, 100 year old (this year) nation. We're now at Morrison Academy and are in the middle of Day 2 for Spiritual Emphasis Week: http://itinerary.richdrama.com. Joyce and I are flying over the northernmost Canadian province en route to Taiwan to lead the Spiritual Emphasis Week at Morrison Academy in Taichung. I'll be performing Beyond the Chariots at Joyden Hall at Iluma (near Bugis Junction) on 1 October at 7.30 pm. It's by invitation only, so if you missed the note I sent out please message me on Facebook: Facebook.com/RichSwingle and I'll make sure there's a place for you. I opened worship at Westchester Chapel this morning. 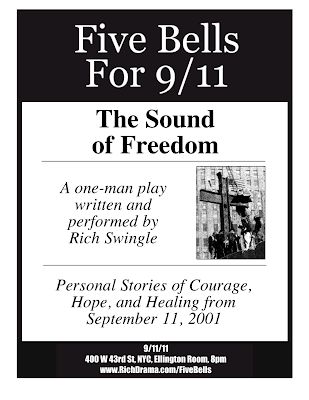 I'll be performing Five Bells for 9/11 tonight in NYC at 8pm: RichDrama.com/FiveBells. 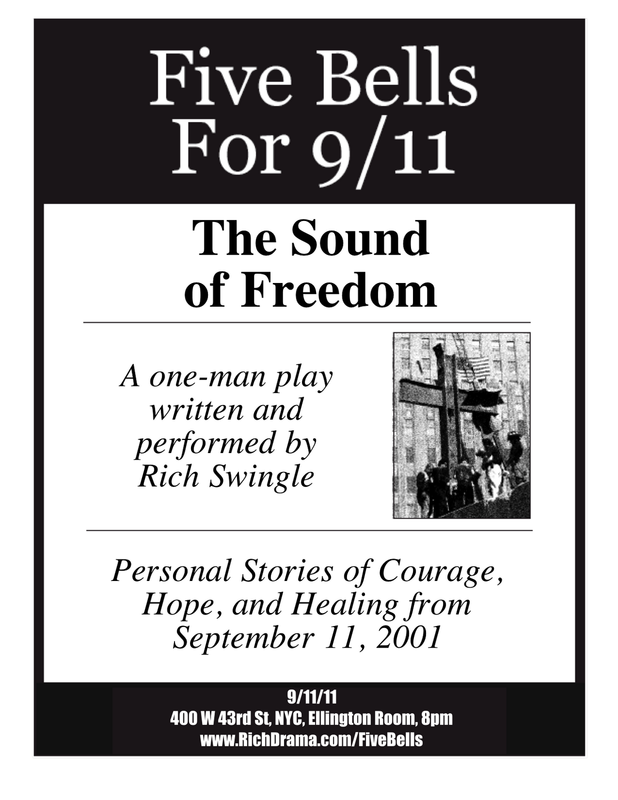 For about a year it's been on my heart to offer my one-man play Five Bells for 9/11 in New York City on 9/11/11. Shortly after those tragic events that changed the world, I took a workshop put on by the Billy Graham Association empowering lay people to counsel those who were traumatized. One of the things they told us was that it's important to bring events back to our memories, especially when we can find positive memories that were there, too. That's exactly what Five Bells for 9/11 does. The play tells the stories of three people that were directly impacted: Bruce Van Hine, a fire fighter for Squad 41 in the FDNY; Lana Ho Shing, a mutual funds specialist for Morgan Stanley, and Father Brian Jordan, a Franciscan priest at the Church of St. Francis. Ann Van Hine, the wife of one of the characters in the play said, "We shouldn't be coping, we should be hoping." 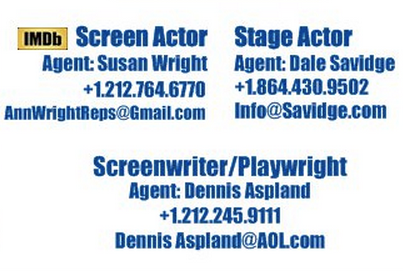 It is my deepest desire that this play will bring hope and healing to those who experience it. If you're in or near the city I hope you can join us. Or if you know of someone that would be encouraged by it's message please invite them. It will be performed at 400 W 43rd St at the corner of 9th Ave. Tell the security guard that you're there for an event in The Ellington Room. The play will begin at 8pm. There is no charge and no offering will be collected. The play will also be performed at the home church of Bruce and Ann Van Hine on September 9 at 7pm. For more information click here. Rich, thanks so much for such a powerful and moving performance and message. I'm performing Five Bells for 9/11 (http://RichDrama.com/FiveBells) near Washington, DC, for the first time. The King's Chapel is hosting it. This is the church that recruited me and several MasterWorks (http://RichDrama.com/MWF) students for the film For the Glory (http://RichDrama.com/ForTheGlory).